At this months Full Council meeting I will be asking my fellow Councillors to support a motion to write to Education Minister Damian Hinds to ask to halt the Government’s funding cuts in education. But according to the Government these cuts don’t even exist. The parrot like line from the Government of “Record spending in education” was joined this week by “the UK is the 3rd highest spender of education in the world” after an OECD report was released. So all must be rosy in the education world then? So why did 2000 head teachers recently march on Downing Street to protest about funding cuts? Why does the Institute of Fiscal studies say per pupil funding has been cut by 8% since 2010? Why does the National Education Union say 88% of schools face cuts between 2016-2020? Why does the School Cuts website say that here in Reading we will lose £281 per pupil? And why does every Head Teacher I meet, at every type of school raise funding as an issue? Firstly the almost laughable misuse of statistics for “Record funding” claims. More money is going into schools than ever before because we have more students. Its that simple. Only PER PUPIL funding should be considered. When this is added to the fact that fully deserved (and not to the level even recommended by the teachers pay review body) teachers pay increases have not been funded, NI & Pension contributions have risen and general inflation is added, budgets have been hit hard. Much like local Councils, the “efficiency savings” are gone, only bone is left to cut. This means larger class sizes, fewer teachers, bigger workloads, less subject choice and less outside help for our children, especially the most vulnerable. What of the OECD report? It did indeed say the UK is the 3rd highest spender on education in the world. But that’s the UK not the UK Government and education is not just schools. So it actually included private spending on education, including private school fees of thousands of pounds a year which only the wealthiest in society can afford. And it also included tuition fees spending of £9250 a year , which the report also pointed out where the highest in the world. This is not the glowing endorsement the Government would like us to believe. The OECD report also said teachers salaries have fallen in real terms, that early years funding is severely lagging and that as a share of GDP education funding has fallen. The Tories in Government have never valued education and many never will. Former education Secretary Justine Greening said last week “It (the treasury) doesn’t have a framework for properly valuing investment in people whether it’s health or education. Instead it’s always been seen as a cost and the treasury likes to manage costs down”. 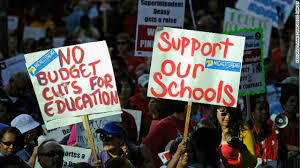 Education is not a cost but an investment, it needs to be properly funded and our Heads and schools need to be listened too before it’s too late. This entry was posted in Education on October 5, 2018 by Ashley Pearce.